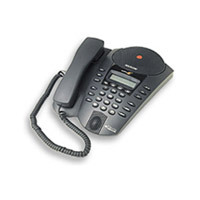 Polycom SoundPoint® Pro : SoundPoint Pro SE-220 seamlessly integrates handset and headset telephone functionality with crystal clear, hands-free voice conferencing in an elegant personal business phone. With the touch of a button, SoundPoint Pro SE-220 lets you hold clear, multipoint conference calls with up to two additional participants. Polycom's Acoustic Clarity Technology enables callers to speak when they want without clipped sentences and one-way conversations that are common with ordinary business speakerphones. The SoundPoint Pro SE-220 has versatile features like a front-facing microphone for voice conferencing, and dialing is quick with the 36-number speed-dial capability. You can also connect an optional headset for quality, hands-free applications.